Law Firm Launches Online Service to Reset Missed Court Dates for Select Cases in Wake County, NC. Raleigh, NC law firm Barker Richardson today launched a new service to accept applications online for clients seeking to reset missed court dates. ResetMyCourtdate.com won't work for every case, but certainly many of those set in the Disposition Court will qualify for the terms of the site. Failure to Appear (termed "FTA") at a properly noticed Court hearing can (and should) cause considerable concern to a defendant; however, if the FTA is properly and quickly addressed, having missed the appearance can be resolved with less stress than one might initially expect. The first thing to note is that not every missed court date is eligible to be potentially reset through the online service. Recognizing that FTA is a new and separate Misdemeanor, each case of FTA must be subjectively evaluated on its individual merits. It has been estimated that up to twenty percent of the defendants scheduled to appear on any given day fail to appear to resolve their case in Wake Co. Disposition Court. 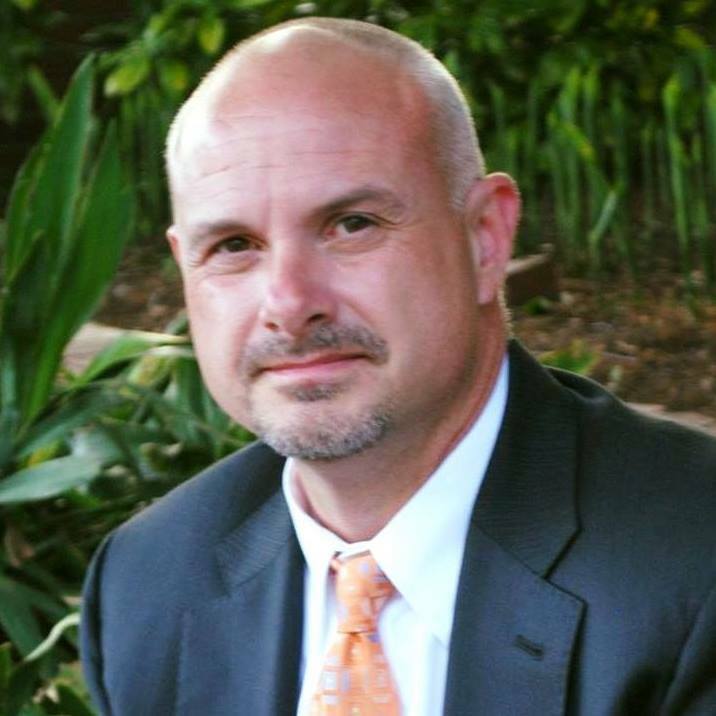 Capitalizing on the huge potential savings of Court and Law Enforcement resources, not to mention the stress savings to the defendants themselves, Barker Richardson hopes to streamline the process for defendants to petition the Court to reset their missed cases and avoid the added consequences that might otherwise occur. The new service adds to the firm's growing list of online-accessible features to help clients resolve Wake County, NC traffic and criminal cases as well as make initial inquiry regarding eligibility for expunction of prior criminal convictions. The firm's expungement site (ClearMyNCrecord.com) features the NC Expungement Assessment Tool (NCEAT) and outlines the information necessary to expunge cases that have been voluntarily dismissed from an individual's criminal record. The iPlea Intake Form rounds out the firm's online assets and is accessible from the firm's mobile website (m.barkerrichardson.com). iPlea collects the information necessary to assist clients in resolving traffic citations in many counties across the state. "I have believed for a long time that the Internet would continue to grow in importance as a tool for helping lawyers provide legal services to their clients in an efficient and cost effective manner. In 2001, I Trademarked 'Pioneering E-Legal Solutions' in conjunction with launching the first website where a client could engage an attorney online to assist with resolution of a speeding ticket. I am so pleased to be able to offer our clients another cutting edge tool to serve them in a cost effective, convenient and value-driven way." Blog content provided by Daniel T. Barker of Barker Richardson, PLLC, Copyright 2018, all rights protected. As 2017 comes to a close and you ponder year-end philanthropic opportunities, please consider making a financial gift to The Child's Advocate. 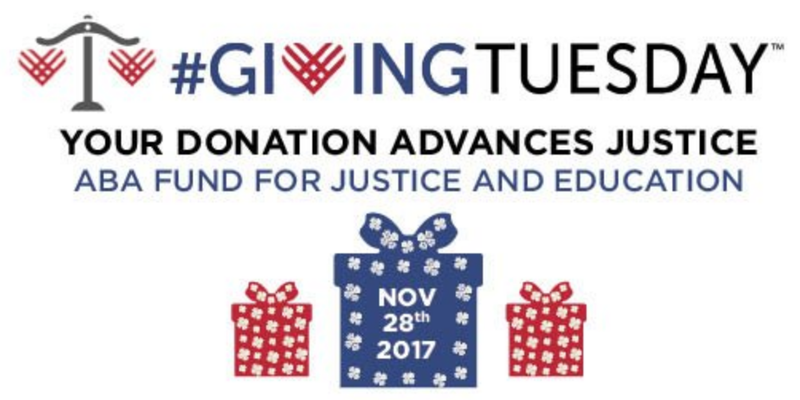 In short, TCA is a special project of the non-profit Legal Aid of North Carolina providing legal representation to children involved in high conflict custody disputes in Wake County, NC. TCA was founded by retired Wake County attorney Sally Hamilton Scherer and remains a vital resource for children in our Courts. "The Child’s Advocate is a project of Legal Aid of North Carolina. Our core service is to provide attorneys to children in highly contentious family court cases. We are appointed by judges in Wake County Family Court to represent children in cases which usually involve one or more of the following: chronic conflict between the parents, neglect, substance abuse, child abuse, domestic violence, continuing litigation, mental illness, or children with special needs. When a trial is necessary, we give the child a strong and effective voice so that the child’s expressed wishes are considered by the Court. We also increase the ability of the Court to obtain timely and reliable information about the child, the parties and the facts of the case. This allows the Court to make the best decision possible to safeguard the child’s interests." North Carolina Speeders take heart, there is a little something for your in the new year, thanks to your friends at the Administrative Office of the Courts. Click below to read about the new system and how it might help you resolve your NC speeding ticket. I am honored to have been elected by my colleges to serve on the Board of Directors of the WCBA and Tenth Judicial District Bar for a three year term. Since 1925, the Wake County Bar Association has been serving the public and the profession in Wake County and beyond. The Wake County Bar enjoys a rich history as one of the most accomplished local bar associations in the country. I am humbled by the chance to serve in its leadership. On December 1, 2017, the North Carolina Administrative Office of the Courts ("AOC") published on their website the updated forms for use in filing petitions for relief under NC's expanded and improved expungement law (N.C.G.S. Section 15A et seq). A short primer on accessing the forms can be found on ClearMyNCrecord.com. Enhancements in the law make it easier for individuals who have prior criminal charges and even some convictions to petition the Court to have prior "criminal" charges expunged from their record. It is worth noting that the law in North Carolina does not currently allow expunction of ANY "infractions." Only "criminal charges" (which includes some misdemeanors and even some felonies) are eligible to be expunged. While some commentators may opine that the law makes it "too easy" for those with past criminal convictions to clear their record, the NC law giving rise to the relief is hardly simple. The expunction statutes in North Carolina are powerful, potentially life altering tools, but they are not "simple" to employ. The recent media coverage and general increase in the awareness of expunction laws has fundamentally changed the way many NC lawyers practice criminal law. Now, at the outset of a representation, analysis typically begins with the question "Will the defendant be able to eventually have this matter expunged from her record?" The real power of the expunction laws lies in the fact that even if a person is guilty of a crime, they may, with the skillful use of the expunction statutes, be able to eventually have the entire event wiped away from the their criminal record. 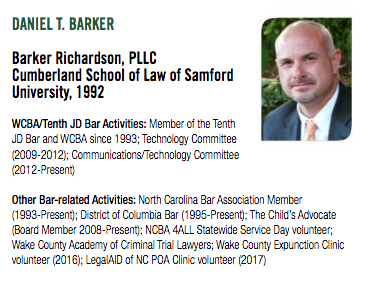 On "Cyber Monday," don't forget "Giving Tuesday"
I'm honored to be on the ballot for the Tenth Judicial District Bar and Wake County Bar Association Board of Directors. Members please remember to vote at the bar lunch on December 5, 2017 at the Hilton North Raleigh/Midtown 3415 Wake Forest Road in Raleigh at 12:15 PM. Raleigh lawyer Ian Samuel Richardson has been named "2017 Nationally Ranked Top 10 Under 40 for Excellence in the field of Personal Injury." 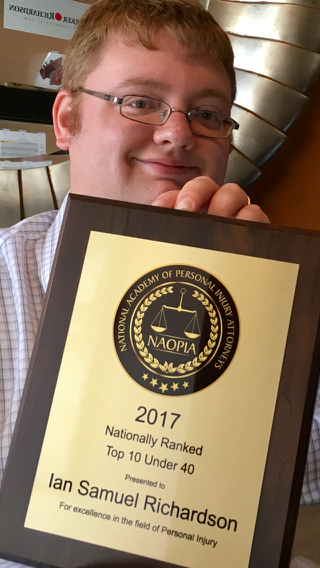 Ian is admitted to practice in all NC Trial Courts as well as the NC Court of Appeals where he authored a brief which was later argued in a case before the NCCOA.